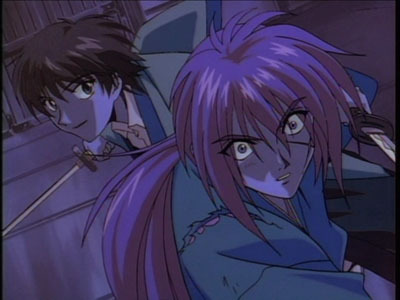 Kenshin and Soujiro both start off in battou-jutsu. A drop of sweap drips off of yumi's face. They attack, and both swords clash. Immediately after, yumis sweat drop lands on the ground. Soujiro announces that he will defeat kenshin with 3 steps short of the shukuchi. He attacks kenshin but misses. He thought he was sure he would connect. No matter, he always keeps his smiling face. Soujiro attacks now with 2 steps short of the shukuchi. He misses again, but he still keeps attacking. 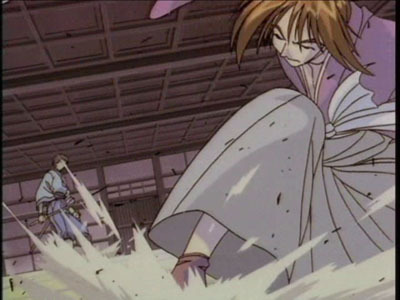 Kenshin jumps into the air, and soujiro does the shukuchi up the wall. 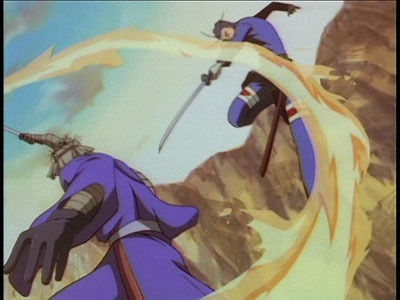 Soujiro flies down at kenshin, and their swords clash once again. It was by a narrow margin that kensin was able to dodge it. Kenshin lands back on the ground. Soujiro once again charges at kenshin with 2 steps short of the shukuchi. 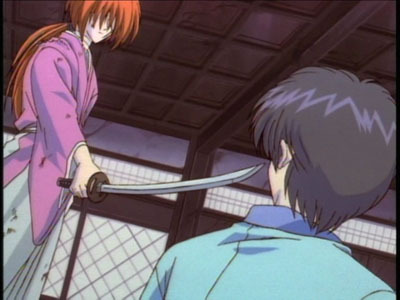 Kenshin decides to use the hiten mitsorugi technique he gained along with amakakeru ryu no hirameki! 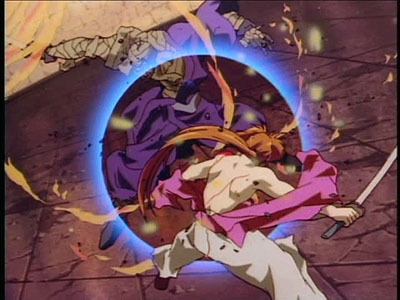 Kenshin uses his ku zu ryu sen on Sojiro. Al nine hits are executed perfectly. 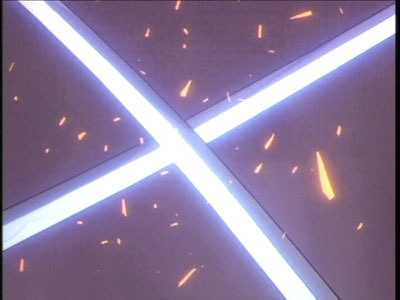 As kenshin lands he notices that all nine hits connected with air! Kenshin looks for sojrio but he is not in sight. 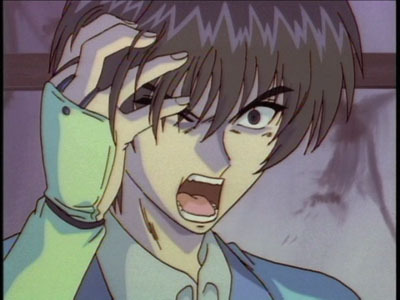 Sanosuke shouts that kenshin has done it. Soujiro corrects him saying that he is the one whos done. 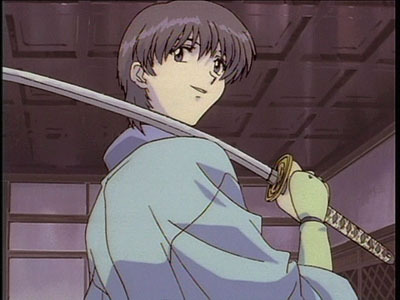 He slashes kenshin in the back. Soujiro is beginning to get annoyed because he keeps underestimating kenshins abilities. He just can't understand kenshin. He doesn't unerstand not killing the weak so the strong can survive. He explains what happened to Mr. Senkaku, and how he should hae been killedby Kenshin. Soujiro atackswith 2 steps short, but his strap breaks on his sandals. He says that he'll be back in a moment after he fixes it. 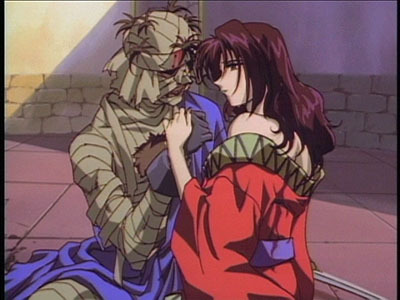 kenshin gets his wounds wrapped by Sanosuke. Soujiro begins to think of his past, and how he was weak. Is being weakreally that bad? 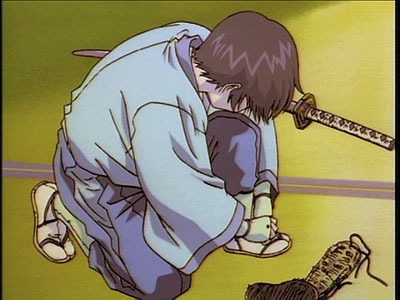 The only thing that protected him was shishios words and the wakizashi, so kenshin is wrong. Soujrio says he will only be 1 step shortof the shukuchi this time, and he will kill kenshin with the next attack. he attacks, but kenshin dodges it. 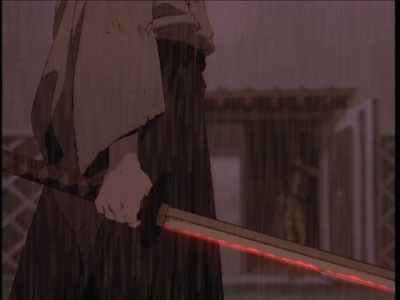 The floor board smashes up, and Soujrio finds Kenshins sword at his face. Soujiro can not find his answer of who is the right, shishio or kenshin. He gets annoyed adcan not take it. Everything kenshin doe annoys the hell out of him. He'll kill him. Sojiro says he'll find his answer with his Shun te satsu! Instant murder if it connects. Kenshin decides to use his ultimate attack. They both disapear. 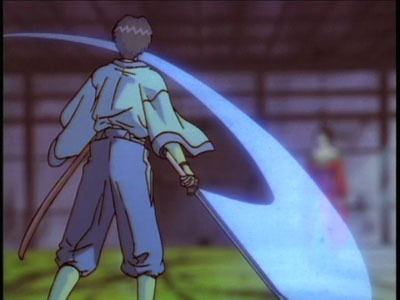 Soujiro using the true shukuchi, and kenshin using amakakeru ryu no hirameki. Both of their swords clash, the speed of their attacks was equal! Soujiro see's kenshins left foot step in. He realizes the truth of his attack. Their swords clash together, but soujrio's sword cracks. 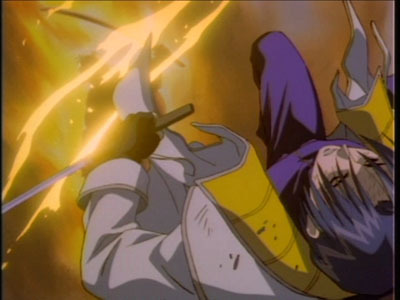 Kenshin shatters soujiro's sword. 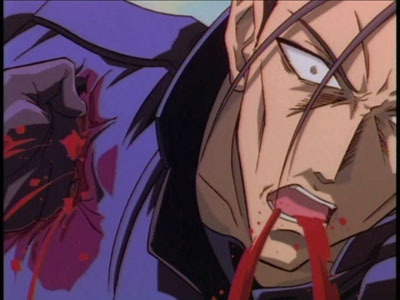 Soujiro is hit with amakakeru ryu no hirameki. He goes flying into the air tattered and torn. He lands on the ground, and yumi runs over. Kenshin takes his breath from the attack. 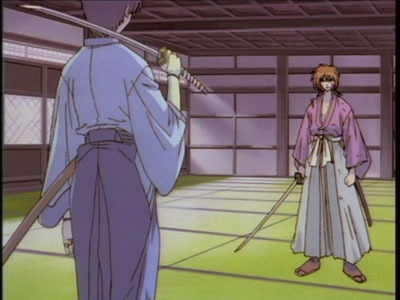 Kenshin explains to soujiro why shishio is wrong. Weak people shouldn't have any other meaning than to be food for the strong. 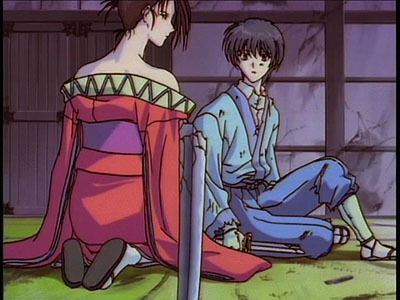 Soujiro realizes that kenshin is right, but he'll have to find his own answer. Shishio and kenshin square off in the final battle! They slam their swords together testing each others skills. 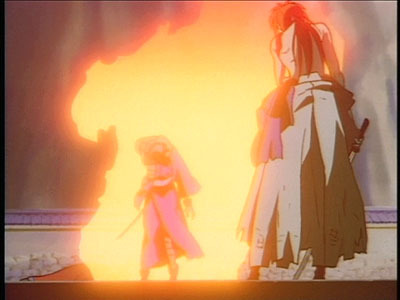 Kenshin manages to get beind shishio but it makes no difference to another former manslayer. Shishio has the advantage here because of kenshins injuries. Shishio introduces his first secret sword technique, the Homuradama! 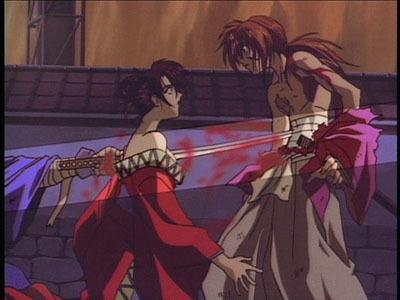 Kenshin gets cut and burned at the same time. 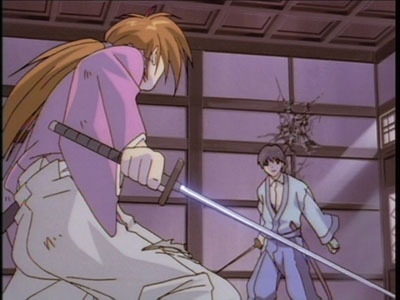 Kenshin sees the truth behind the homuradama, human fat has been caught on the edge of shisios blade. 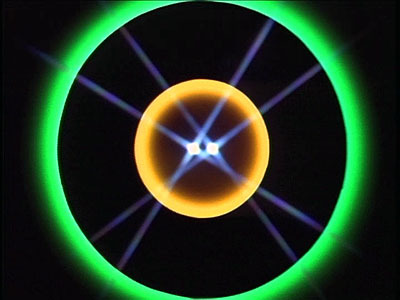 This enables his sword to burn with friction. They clash at it agian and again. 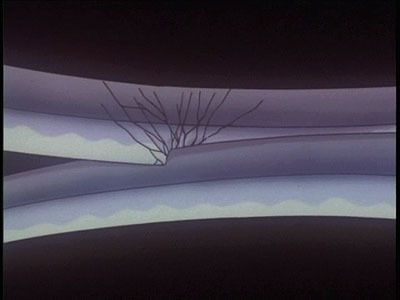 Shishio manages to connect with a few more homuradamas. Kenshin has never fought someone like this before. 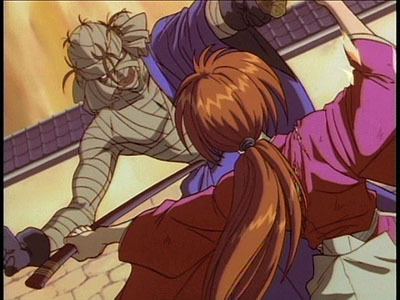 Kenshin then manages to land the Sou Ryu Sen on shishio, but it has no effect! 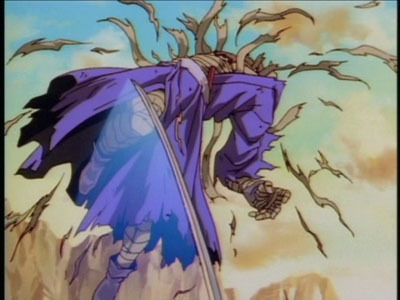 Shishio grabs kenshin and bites a chunk out of his neck. Kenshin falls down for a while. Once he returns to his feet, shishio encircles the bttle field in his flames. He introduces kenshin to the second secret sword technique, the guren kaina! kenshn falls to the ground from the explosion. Smash! 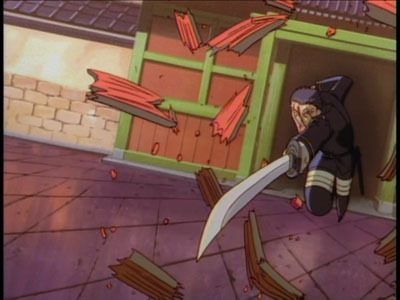 Saito breaks down the door and flies at shishio with his gatotsu! Hecatches shishio off guard and nails him n the head. It does not hurt shishio. 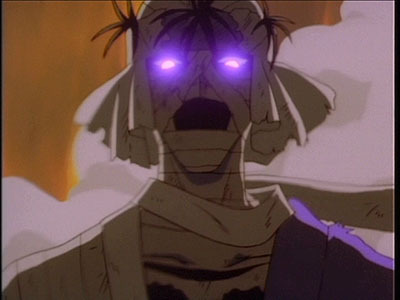 Shishio reveals the hachigane, a metal band around his head to protect him. Saito and shishio go back at it. Saito tris to use the gatotsu second stance. Shishio shows him the homuradama as well. He dodges the gatotsu. Saitos gatots attack hits the ground and smashes a big hole in the floor of shishios inferno room. 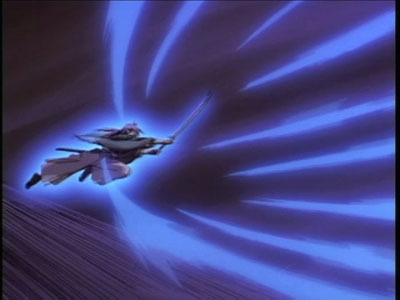 Saito sees shishio jump into the air, he uses gatotsu third style to counter shishios aerial attack. They land on the ground and take a breather. Shishio says something to saito. Saito replies by saying he has droped his guard to say that! Gatotsu Zero style! What! Saitos attack failed? Shishio stabs him in the shoulder with his hand! Shishio causes more pain to saito by pushing his hand in even further! 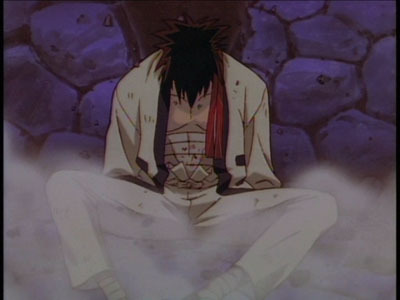 Its over for saito as shishio shows him the same defeat as the battousai did. He blows saito back with his guren kaina. Saito is down for the count. Its not over yet shishio! 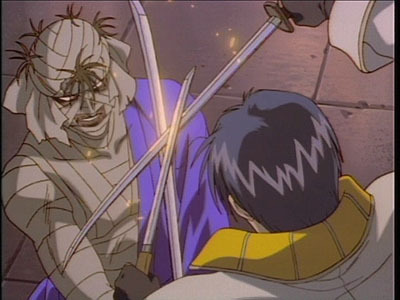 Sanosuke steps in for some revenge on their deaths. to take shishio to hell with him! He gets knocked back by shishio easily with a powerful punch to the ribs. He tries the futae no kiwami! It takes no affect. Shishio quickly closes the gap. Shishio punches sanosuke in the head and he snds him flying into a wall. 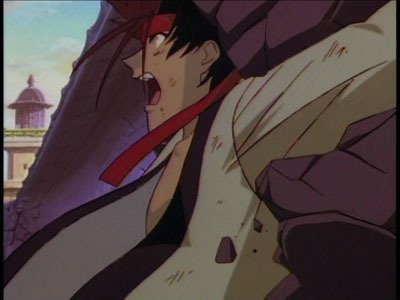 Sanosuke smashes into the wall and it looks like he cannot get up to fight agin. I it over for sanosuke? Saito? Kenshin? 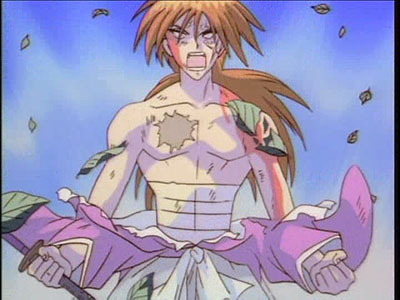 As sanosuke lay fallen, another forgotten warrior apears. Not out of luck yet! Aoshi shinomori stands befre shishio. He announcesthat he will fight in the place of the lost stamina that kenhin lost in his fight with aoshi! Can aoshi stand p to shishio like the others could not? Aoshi and shishio begin battle. 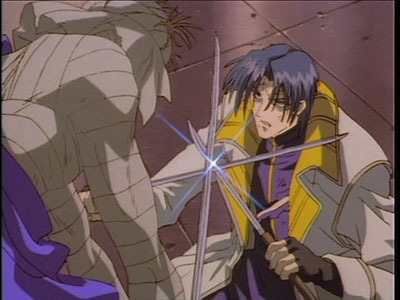 Aoshi doen't have time to attack with shishio constantly attacking him. The only thing he can do is defend himself. He countes shishios attacks, but how long can he last, will he survive? Aoshi is not out of hope yetas he introduces the oniwaban style Goho Juuji technique. He tries to attack with his double kodachi technique but its no match against shishios awesome power. There is nothing he can do. Aoshi starts using the Ryu Sui technique! He moves fast around shishio. Shishio can see every movement clearly, he strikes but misses. Aoshi has jumped onto the roof and back onto the ground. hes behind makoto shishio! he tries kaiten kenbu but is knocked down hardby a homuradama! Kenshin has been revived! He is back on his feet and his swordsman spirit is burning with a desire to defeat shishio. He regains his concsiousness and he is ready to fight. Now the true battle begins. Its round two of the shishio battle. Everyone is back on their feet. Shishio, Kenshin, Saito, Sanosuke, and Aoshi are the only warriors left standing. Now the true battle begin. 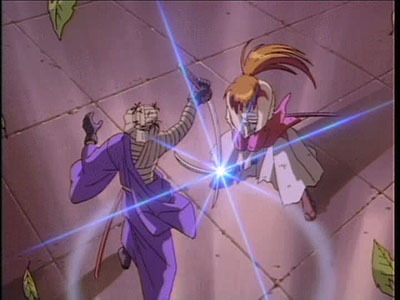 Shishio and kenshin go at it manslayer to manslayer. There swords cross and counter eachothers as evenly matched as can be. Shishios body gains hotter and hotter burning inside him making him stronger. Can kenshin survive this round as he almost couldn't before? No! Shishio manages to get kenshin in the hold for the guren kaina! Hell go out with a back with the same move as before but this tme hell be dead. 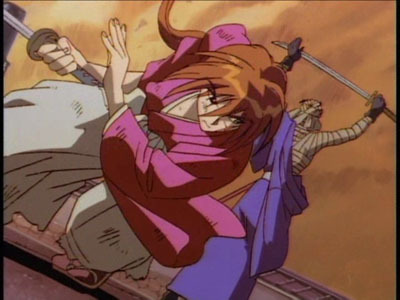 Kenshin breaks free of the hold and starts his move on shishio. 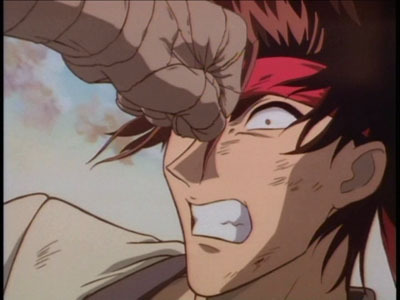 He hits shishio with a 2-hit combo, the Ryu Tsui Shou Sen! Thats not it! It a 5-hit combo! 3 Ryu kan sens of Kogarashi, tsumoji, and Arashi. Shishio retaliates with a perfect homuradama! 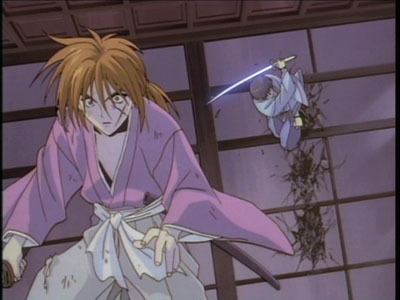 Thast not it, kenshin comes back strong with a powerful KuZu Ryu Sen snding shisio flying into a wall! Shishio recovers a short time after and he is really pissed-off now. He announces the final secret sword, the Kaguzchi! Who will decide the future of japan as the final battle begins! 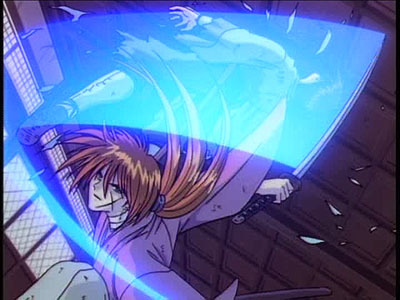 Kenshin uses his ultimate atack, amakakeru ryu no hirameki! Amazing, shishio counters the attack and then parres it! e swipes his sord dow his sheath engulfing his sword in flames, the Kaguzuchi! . 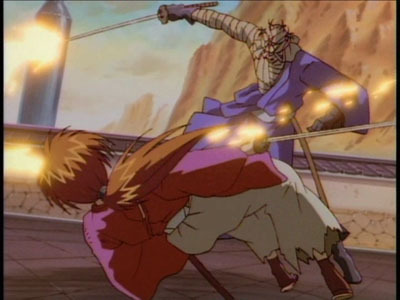 Kenshin steps back around and begins to come back because his attack was so great that it sucked the air back itno a knot. His nails shshio with a second dose of the ultmate attack! I bet shishio never wishes he blocked that attack! 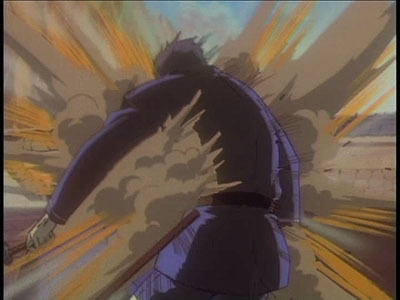 He hurls into the air shredded from the ultimate attack of hiten mitsorugi. 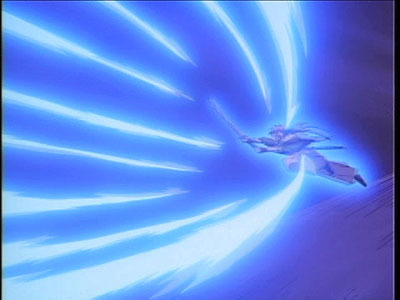 He drops his sword and throws up from the force and pain of the attack. He goes crazy in pain but stillremains on his feet. Is this guy invincible? Shishio and Yumi are together in their final moment. She is happy because she could aide her love in his most important battle. They sittogether in a pool of blood and she tells him to win, and that shell be waiting in hell. 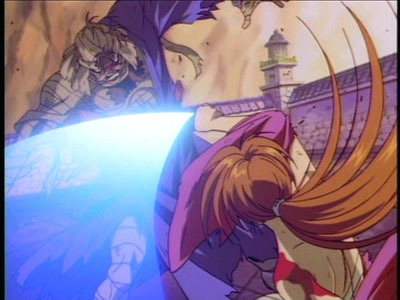 Shishio and kenshin pull all their srength together as they strike once again in the final clash of swords. Shishi has been fighting for a while and his blood starts to turn to avapor. The fat and oil instantly ignite inside of him because of his abnormal temperature. He burns do death. Kenshin and the others have won the battle!